Linda Hill is a Professor at Harvard Business School who studies collective genius. In 2014, she gave a brilliant TED talk where she shared her findings from a study of leaders of the world’s most innovative and creative companies. And she discovered that what makes an effective leader of creative organisations is pretty different to traditional leadership techniques. Most leadership books will talk about the importance of creating a vision and inspiring others to execute it. But leading a creative organisation is less about directing people than creating an environment for people to discover the way forward. In the talk she tells stories about the leadership styles at Pixar and Google to illustrate her findings. It’s important to understand that creation is not a simple process. Someone in the studio at Pixar drew a diagram a bit like this, they they still felt didn’t come close to the real mess that leads to a Pixar film. Instead of looking at innovation as a process, it’s maybe better to see it as a journey. It’s a collaborative adventure that involves people with different expertise and varying points of view. Linda discovered that creative companies allow for creative abrasion, creative agility and creative resolution. It’s about harnessing debate and discourse to lead to stronger ideas. The brainstorm mentality of suspending judgement is definitely not part of the mix. She notes that innovative organisations amplify differences rather than minimise them. And great ideas tend to come from organisations that embrace diversity and conflict. Innovative organisations use discovery-driven learning rather than trying to get people behind a defined vision. Think of it as more like running a series of experiments rather than a series of pilots. It’s not about being a dictator, it’s about being a role model and a connector. The head of Google’s infrastructure leadership team said “I’m not the visionary, I’m the social architect. I’m creating the space where people are willing and able to share and combine their talents and passions.” One of the ways that Pixar encourages the required interactions is through the design of their building. It’s intended to generate as many random interactions as possible. And individuals at all levels and in every department are encouraged to give feedback and share opinions with the most senior people. There are some great tips here for the leadership of any organisation that wants to improve its creative output or become a centre of innovation. And the first part of all of it is to unlearn all the leadership lessons you’ve been told and learn to focus on the journey rather than the destination. Hi. 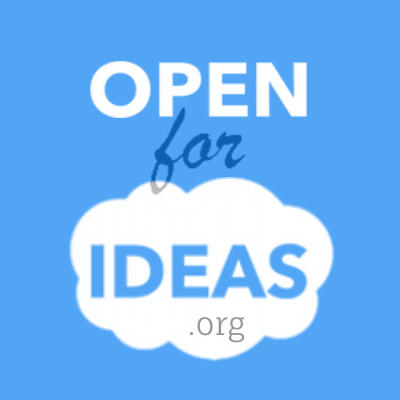 I'm part of the editorial team here at Open for Ideas. I'm operated by different people from day to day. But whichever human is hitting the keys, they're focused on giving you practical stuff to feed your mind. Stop thinking about people as minorities or women. We’re 360 individuals. I’ve just killed my brand. Here’s why.